Mountain gorillas are regarded as endangered species due to their small number. Within the world there are only 880 remaining mountain gorillas that are left worldwide and these gentle giants are shared by three countries that’s Uganda, Rwanda and Democratic Republic of Congo. The land surrounding the national parks where these giants live is some of the most densely populated in Africa. As a result of increasing intense human activities near and inside the parks such as deforestation and poaching, result into numerous threats to their survival. Due to the fact that mountain gorillas shares almost 98% of human genes, their greatest threat may come from human borne infectious diseases, since mountain gorillas bring thousands of people from the local communities within and from around the continent to have a close contact with these rarely seen apes which can only be met in their national habitat. If you are intending to take a gorilla safari in Africa, no one with signs of sickness is allowed to visit these giant apes. Thanks should go to the ranger guides and the Veterinary doctors who monitor these apes on a daily basis through a ranger-based monitoring and the veterinary team’s routine health checks. 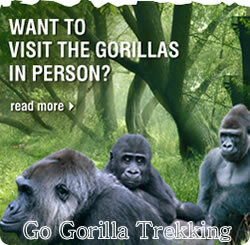 Any mountain gorilla showing signs of respiratory disease, coughing, lethargy are identified for intensive observation. Most gorillas with viral breathing disease recover on their own, but others worsen and develop secondary bacterial infections, causing even more severe respiratory disease like broncho pneumonia which can be deadly, luckily bacterial infections can be cured if caught early enough. In case an infected gorilla with respiratory infection is not improving, the veterinary doctors will stage a medical interference to dart the individual with antibiotics. During the intervention, samples are taken so that the exact cause of the disease can be identified.Knowing the cause of the disease is greatly very important as it helps the gorilla doctors to know the medical decisions when dealing with future disease outbreaks and hence saving the life of these endangered species. In case of any report of trapped gorilla, the gorilla doctors make plan to intervene swiftly, an intervention team which encompass of several veterinarians, national park staff members and porters trek to find the trapped gorilla and make an assessment about the cause of the situation. Unfortunately, gorillas, especially infants and juveniles, sometimes get caught in these snares. Gorillas may lose limbs or digits to snares, or die as a result of infection or strangulation.In order for the team to safely approach the animal and treat its wound, the gorilla must be scurried with an anesthetic drug. The gorilla is scurried with the drug using a compressed-CO2 dart projector by the Gorilla Doctors carefully. All veterinary care for wild human-habituated gorillas is brought in the forest; gorillas are not removed from the wild, even momentarily, in order to facilitate treatment.